To download above questioner follow this link or visit Paris MOU web site. 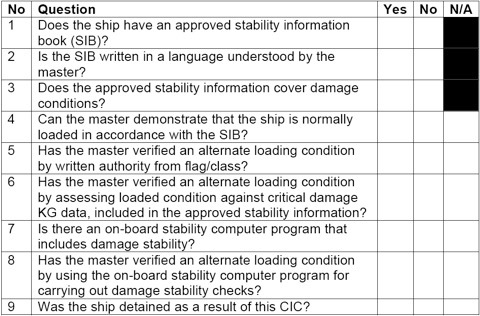 No:2 Same as vessel’s workable language and/or ISM language. No:4 Cargo loading plan. ISM prosedures. Companies’ operating procedures/forms/check lists. No:5 Alternative hold loading, if accepted, must be stated in loading manual. No:6 Cargo loading plan. ISM prosedures. Companies operating procedures/forms/check lists. No:7 Sea going ships contracted for construction on or after 1st July 1998 classed as Category I*, with length more than 100m. For more info see UR S1. No:8 Keep on board evidence of loading computer print outs for specific loadings or evidence according with ISM procedures. • Chemical tankers and gas carriers. guidance, and in addition the exception given under Category I.